Macroeconomic estimates from the UK’s private sector research firms are suggesting GDP growth in the first quarter was not quite as dismal as official statistics might have shown, possibly rendering the Bank of England’s (BoE) latest policy decision inadequate. Kristian Rouz — The Bank of England's (BoE) decision to keep base interest rates unchanged could have stemmed from a wrong interpretation of macroeconomic data for the first quarter. This according to Andrew Goodwin of Oxford Economics, who argues that the UK's economy is not in such bad shape as the recent batch of data may have suggested. 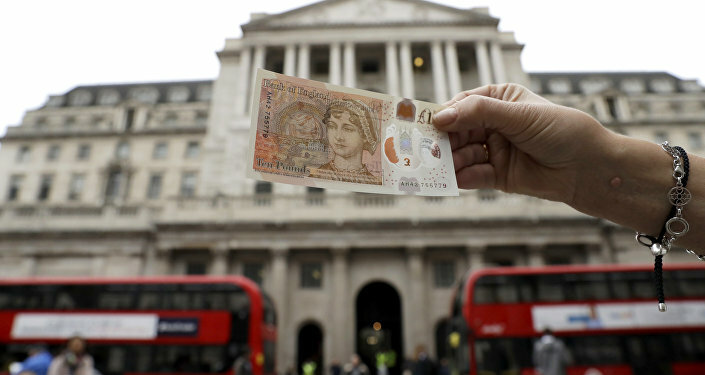 The BoE voted 7-2 to leave interest rates unchanged at 0.5 percent during the latest meeting of its Monetary Policy Committee (MPC). Policymakers cited severe weather conditions as having hampered Q1 consumption — including retail revenues and household spending — along with the lingering Brexit uncertainty. However, the UK's inflation is still above the BoE's 2-percent target at 2.5 percent as of March — its lowest in 12 months. Britain's economic growth slowed to 0.1 percent quarter-on-quarter in Q1 from 0.4 percent in the previous quarter, yet, annual GDP growth only slowed to 1.2 percent from 1.4 percent in 4Q17. Such dynamics is not dramatic enough to justify the BoE's excessively dovish approach to monetary policy, Oxford Economics' Goodwin argues. "We are unconvinced and see a number of reasons, both related to the data and the wider economic backdrop, which suggest that the gloom that has been increasingly enveloping the UK economy has been overdone," Goodwin said. This comes as the UK's Purchasing Managers' Index (PMI) in the manufacturing sector was at 53.9 in April, according to Markit Economics — far above the 50.0 recession threshold, albeit still at its 17-month slowest. Meanwhile, services PMI actually posted an acceleration to 52.5 — again, above 50.0, and suggesting an ongoing expansion — despite the reportedly slower retail sales and individual spending. Goodwin says the official data from the Office for National Statistics (ONS) poorly correlates with the data from private-sector pollsters and economics research firms — such as the Chartered Institute of Procurement & Supply (CIPS) and Markit. "On a sectoral basis, the official output series and CIPS results were poorly matched in Q1, so merely splicing the Q2 survey data onto Q1's official series does not offer an accurate steer," Goodwin said. "In particular, both the manufacturing and construction sectors reported much stronger survey results than was reflected in the official data. In Q1, the manufacturing PMI was consistent with quarterly output growth of 0.7-1.0%, in contrast to the official estimate of just 0.2%." This is raising questions why — if that's the case — a well-respected governmental body such as the ONS would consciously lower its estimates of Britain's economic health. Additionally, if the BoE's policy decisions are based on the official statistics — which might be inaccurate — the ONS' methodology might have negative effects on the UK's monetary policy. This could put Britain's economic future at risk. "Much of the subsequent media commentary has argued that these results suggest we are unlikely to see much of a rebound in GDP growth in Q2 and that the UK economy is in the midst of a sustained slowdown," Goodwin reflected on the future path of the BoE rates policy. Meanwhile, several macroeconomic reports from CIPS have suggested that the UK's economy is gradually improving, as its slowdown in the Q1 was much less significant than harsh weather conditions would have suggested. Typically, a cold winter renders quarterly GDP growth rate negative, which has been observed across many advanced economies over the past few years. But the UK's economic growth in 1Q18 was still in positive territory, and as the winter neared its end in early March, developments across several sectors pointed to a substantial firming in the second quarter. "The ONS assumed a 0.8-percent month-on-month drop in distribution output in March, consistent with the snow-related drag on retail sales, so as with construction output, this sector is due a sizeable revival in April," Goodwin said. Meanwhile, the BoE's decision to keep rates at accommodative levels is encouraging news for consumers. Analysts are expecting a rise in consumer spending — albeit partially fueled by credit card debt expansion — this quarter, also supported by the slowing inflation, and ongoing gains in employment and wages.